Five learning activities teach shape drawing, capital and small letters, and letter and number writing. Through graduated learning, you can develop your skills, starting with simple line and shape drawing and moving up to actual object and letter formation. You can draw and write directly on the interactive touch. 10 number buttons and 26 letter buttons introduce numbers, letters and objects with fun sounds and messages from Doc. Carry handle for on-the-go fun! Interactive touch screen with attached stylus. 26 letter buttons and 10 number buttons; 5 learning activities; Teaches letter and number writing; Features the real voice of Doc! Size H27.9, W35.6, D7.8cm; Batteries required: 2 x AA (included); For ages 3 years and over; EAN: 3417761398036; Not suitable for children under 3 years old. Only for domestic use; This toy does not provide protection; To prevent possible injury by entanglement remove this toy when the child starts trying to get up on its hands and knees into a crawling position. 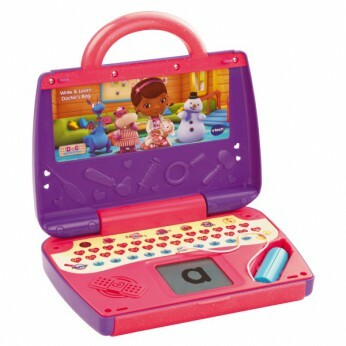 This toy costs approximately £29.99 (for the latest and best prices make sure you check our retailer list for the Doc Mc Stuffins Write and Learn Doctor’s Bag above). In our review of Doc Mc Stuffins Write and Learn Doctor’s Bag we classed it as being suitable for ages 3 years, 4 years, 5 years but recommend you check the manufacturer specific advice before purchasing.